Banksy, you've got competition. 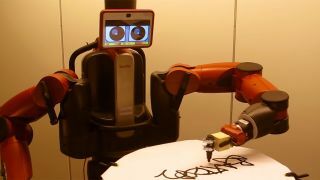 Researchers from Goldsmiths University of London's Department of Computing, alongside the Idiap Research Institute in Martigny, Switzerland, have developed Baxter, a robot capable of reproducing graffiti tags with the same fluidity as a human. Baxter can write tags in pen, paint and neon lights, producing its own name in a graffiti style that first emerged in New York in the late 1960s. It's a skill that's considered incredibly difficult to mimic smoothly, making Baxter's robotic output particularly impressive. Previous attempts have proved superficial, with Baxter's predecessors only managing stiff, stilted reproductions lacking the finesse of human counterparts. By comparison, Baxter's tags appear incredibly fluid, highlighting the advancements in both robotics and tracking tech to make such arty output possible. Baxter is actually a modified version of a workforce factory robot of the same name. Professor Frederic Fol Leymarie and PhD candidate Daniel Berio from Goldsmiths, and Dr Sylvain Calinon from Idiap have modified the bot with weights to better approximate a human arm, in line with their "research into different aspects of human motor skills, and the perceptual processes and movement dynamics underlying the production of various forms of art." With the weights based on the mechanical properties of Baxter's manipulator, the robot's tracking accuracy and stability are set in such a way as to carefully mimic the brush pressure of a true human artist. More on Baxter can be found in the research paper "Learning dynamic graffiti strokes with a compliant robot."